University of Alabama in Huntsville – Center for Management & Economic Research (UAH CMER) partners with commerical industry, government agencies, and non-profit associations on a wide range of projects which benefit the economic development of Alabama and the United States of America. 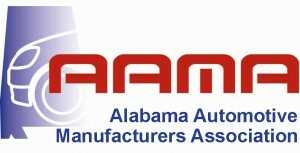 The Alabama Automotive Manufacturers Associate (AAMA) works to provide a forum for interaction among automotive companies in Alabama, to share information among its members and to provide an awareness of manufacturing trends, techniques and concerns. The mission of AAMA is to promote growth and continuous improvement of automotive manufacturing in Alabama. Objectives of AAMA include – providing strategic direction for Workforce Development by strengthening the Business and Education alliances in Alabama; improve automotive manufacturing processes and systems in Alabama; conduct programs to share knowledge on issues impacting the automotive industry in Alabama. Alabama Technology Network (ATN) is a corporate partner with AAMA and works closely with its board of directors to offer training and technical assistance opportunities to AAMA members in a wide range of business areas to support members’ growth and profitability. ATN is the National Institute of Standards and Technology’s Manufacturing Extension Partnership (NIST MEP) center affiliate for the state of Alabama working to strengthen U.S. manufacturing. UAH CMER – ATN is a designated MEP sub-center that offers lean six sigma -continuous improvement, innovation, and strategic business services – both training and on-site support to automotive manufacturing suppliers. AAMA was founded at UAH under the direction of its first executive, Dr. Bernard “Bernie” Schroer, and UAH CMER continues to provide office space and support to the organization. Questions about AAMA or how to become a member of AAMA? Email Lynsey Delane, the AAMA contact within UAH CMER office, for membership forms, or upcoming AAMA sponsored events. Alabama Aerospace Industry Association is a private non-profit, industry-led organization of aerospace and defense industry leaders committed to growing business in Alabama. Formed in 2003, AAIA’s mission is to promote the growth of aerospace in Alabama. The association provides an industry-led voice on opportunities and issues for economic growth. UAH CMER has worked to support the Alabama aerospace industry through the AAIA since 2003. From providing training opportunities to hosting leading-edge conferences, CMER and AAIA work together to support one of Alabama’s major industries. The Alabama Aerospace Industry Association has established an Alabama Aerospace Industry Directory. The initial release of the directory was January, 2013. The AAIA directory continues to be updated at least annually or on as frequent a basis as possible. Companies that are current AAIA members have an enhanced listing. Non-members are included with only basic information listed. Members are eligible to be included with the enhanced listing as a benefit of AAIA membership. Only companies active in the aerospace industry with a physical presence in Alabama qualify to be included. Want to check and see if your company is an AAIA member? Want to submit your company information for the AAIA Directory? Questions about AAIA or the AL Aerospace Directory? The Center for Management and Economic Research (CMER) is a research center associated with the UAH College of Business. CMER assists the UAH COB by serving business and industry through consultative assistance, training programs and research, and by disseminating economic information. For more information on the UAH College of Business, visit their website.